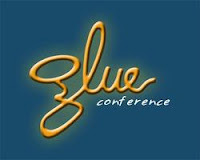 Last week, I attended the Glue Conference in Denver. This was a high IQ event. It was a conference about the future of the web – not your typical future prognosticators, but the movers and shakers making the web, presenting what’s on their mind. It became clear to me how infantile the web really is. I recently saw a commercial for “You’ve got Mail” (Hanks/Ryan) on TV. The preview included the AOL sounds and icons. My kids asked did the PC really say ‘You’ve Got Mail’? That movie was released in 1998 and the technology is unrecognizable. The techno-verb “twitter” is only a few years old. The verb “Google” was added to Webster’s dictionary in 2006. I read/skim almost 200 articles/posts a day in my RSS reader, including ones stating RSS is (already) dead. The point is things are moving fast and the web is where they are moving to. There are several existing and emerging web technologies – how to get them to work together is where the glue comes in. But it was definitely the wrong week to stop sniffing it. The conference introduced several topics that got me thinking. For example, discussions of identity and reputation – how to make them portable and do we want to make them portable? Sometimes we have different reputations on purpose, and if our reputation was portable, who’s standard? Consider eBay’s seller reputation system or “feedback” versus Craigslist’s near anonymous system. How would eBay and Craigslist be different if eBay feedback scores were portable to Craigslist? Would eBay resist it (because it strengthens Craigslist’s service) or would eBay endorse it (because it positions eBay’s feedback system as the authority for the majority of private web ecommerce)? Perhaps you can see feedback on Craigslist, but only get to cast feedback scores on eBay transactions. Reminded me of George Costanza’s Worlds Colliding, sometimes its best to keep parts of our lives separate. The Internet has impacted the way we live, work, and play, but we ain’t seen nothing yet. At Glue, I got a taste of what could be. I’m not a developer and don’t speak /Dev (an unfamiliar variant of Geekspeak). Putting this in a telecom perspective, the tools, APIs, resources, and capabilities for voice enabling applications is becoming amazing. There are several emerging companies that are creating powerful cloud based tools for voice enabling web applications. Companies in this space include Cloudvox, IfByPhone, Jaduka, Ribbit, Skydeck, Twilio, and Voxeo. I’ve Googled a bit to see what people are doing with these tools. I found a simple iPhone app that dials crank calls. Another discussion on creating an application that dials-out to confirm dental appointments. There is programmer that created an inexpensive solution to update the softball league with game information. But these tools are not limited to hobbyists (they are just the ones blogging about it). Twilio CEO Jeff Lawson claims that the core functionality of Google Voice can be created in only 15 lines of code using his service. Plus, since it uses Amazon’s cloud, customers can develop and implement powerful scaleable voice enabled applications with zero capital outlay. (Jeff Lawson presented at GlueCon). This has powerful implications for UC applications which strive to integrate voice into work processes. Jaduka doesn’t like the term UC – they prefer communications enabled business process (CEBP). Thomas Howe, Jaduka’s CEO feels the distinction is important. According to Howe, “UC is people-focused, and attempts to make the personal workflow more effective and faster. CEBP is process-focused, and attempts to extend business workflows to human beings where appropriate.” He quips “Oh yes, I’m very happy that Microsoft and Cisco are working hard to make people more productive. Now Doris in accounting will lose my purchase order 20% faster!” I think Howe is suggesting that broad UC applications sold to thousands of customers can’t have the same impact (to Dorris) as a custom developed voice enabled application specifically written for her. UC and CEBP are tools, but UC provides Dorris tools where Jaduka’s tools are useless to her unless someone redefines the process and writes her complementary software. But UC or CEBP or whatever acronym you prefer will enable voice to work its way into core applications like never before. But it isn’t just old hooks with new APIs – new technology capabilities too. I’ve written several posts about how voice recognition is moving from science fiction to reality this year. However, voice recognition applications remain expensive. Almost all of these new voice enabling firms have voice recognition capabilities. Consider the simplicity of Goog-411, it performs speech to text conversion of the requested business and city – performs a web query, speaks back the information and performs a call transfer. This application can be applied to internal databases with inexpensive services from one of these providers. Or the ability to record calls and make them searchable or even translated without purchasing sophisticated equipment. These firms are playing the Field of Dreams strategy: if you build the tools, they (customers and applications) will come. It is probably a safe bet, and one that certainly threatens the traditional PBX makers that have not seen this type of openness or competition before. I recently posted a position outlining the potential benefits of a really dumb PBX – keep the phones simple and put the intelligence somewhere else. That model makes more sense with the potential applications available from these emerging providers. Of course, they work just as well with smart UC phone systems, but I don’t believe a single vendor will be able to create the flexibility required as needs become more complex. I also foresee a major disruption to established pricing models. The traditional players are still charging for too specific features, like the ability to make a cell phone ring simultaneously with desktop phones (charged per cell phone). In many ways, The Glue Conference stirred more questions than answers. The high point was Mitch Kapor (the Lotus Legend) that spoke about humanizing technology. He compared Twitter via open follow as a humanization of interesting rather than relying on computer algorithms to define it. He said the social web restores the balance of power between people and machines and feels the web is entering a Cambrian Explosion of Innovation. His views seem confirmed by the shear amount of game changing technologies entering the voice space. By the way, Kapor is an investor in Twilio.